To objectively address the “no credible evidence” health effects claim, an industry position will be stated and then evaluated. The Public Utility Commission of Texas (PUCT) issued a report in December 2012 that purports to address concerns over the potential health effects of exposure to the radiofrequency (RF) emissions from the wireless technology of advanced metering. This report has recently become somewhat of a universal reference by utility companies across the nation as a document that supposedly “proves” that there are no health effects from smart meters. For purposes of this blog article, let us just review the cover letter for the document itself and one key statement in the report that was transmitted to the PUCT by its author, Alan Rivaldo, a cyber security analyst. It was inappropriate to rely “heavily” on smart grid-related industry organizations as the basis for an evaluation of possible health effects associated with smart grid-related radiofrequency (RF) emissions. These organizations are scientifically biased, financially supported by electric utilities or organizations that have a vested interest in deploying smart grid technologies, and have effectively no expertise necessary to properly evaluate health and medical evidence. Certainly Alan Rivaldo, a cyber security analyst who primarily authored the PUCT report, has no expertise with regard to evaluating health related evidence. There is overwhelming evidence that biological effects do occur as a result of exposure to low-level RF signals. There is, however, an ongoing debate within the scientific and medical community as to the degree to which those biological effects are harmful or irreversible. It is basically a straw man argument to use language such as “biological effects have not been proven.” The word proven is generally interpreted to mean: “Having been demonstrated or verified without doubt.” In biology and medicine, almost nothing can be “verified without doubt.” This straw man argument is thus inappropriately used to justify the non-conservative premise that “definite” proof is needed prior to taking any action to protect the public. In addition, use of the term “credible evidence” is subjective. The word credible generally means “believable” and what may not be believable to a biased cyber security analyst or an electrical engineer may be totally believable to a medical doctor or biochemist. In a legal sense, credible refers to how a prudent person would view evidence as believable. It is asserted that if available objective evidence is reviewed, a prudent person would conclude that biological effects do occur as a result of exposure to low-level RF emissions. No human health impact studies were conducted prior to the deployment of RF emitting smart grid technologies, which include the smart meters themselves as well as the associated gatekeepers and routers that are part of the overall mesh communications network for each utility’s smart grid system. From a smart grid industry perspective, safety claims for smart meters are made based upon industry testing documents demonstrating that RF emissions from individual smart meter devices comply with outdated Federal Communications Commission (FCC) exposure guidelines, and then referring to such documentation as a “study” showing that wireless smart meters pose no health risk. Unfortunately, FCC exposure guidelines were never formulated to fully protect human health. In fact, they are only believed to protect against injury that may be caused by acute exposures that result in tissue heating or electric shock and burn. 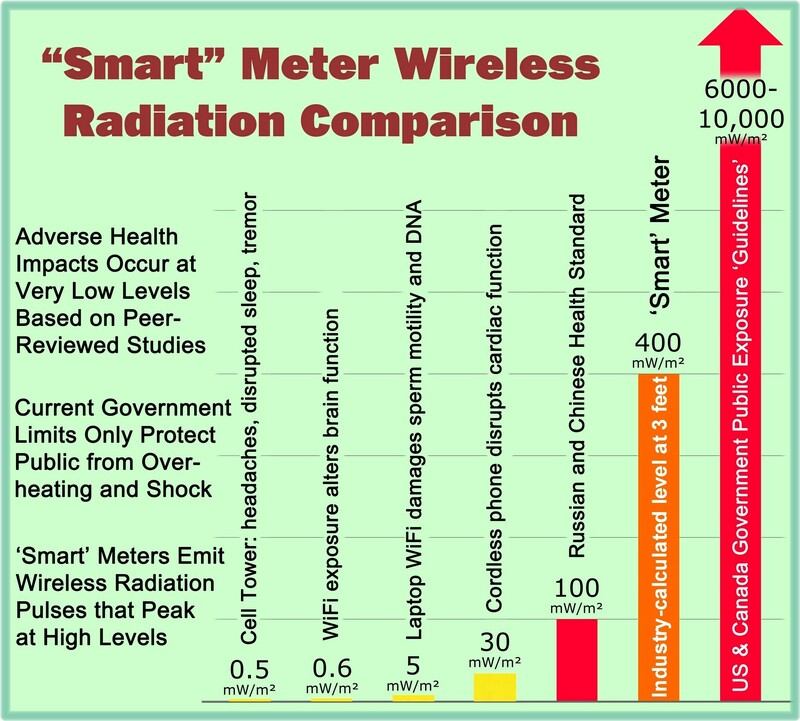 FCC exposure guidelines have no biological relevance to protect humans from chronic exposure to pulsed radiofrequency radiation emitted by devices such as smart meters. Therefore, RF emissions from smart meters devices being installed on every home in America are simply unregulated. There is evidence of adverse health effects caused by exposure to smart meter-related electromagnetic field emissions based upon documented health effect surveys. It therefore follows that claims made by utility companies, smart grid advocacy groups, and the Public Utility Commission of Texas that smart meters are safe and pose no health risk are completely unsubstantiated. Recognizing that individual consumer smart meter refusals are only a partial solution to the many issues that exist with smart meters, what is also urgently needed is a complete moratorium on the deployment of digital smart meters and associated smart grid components. This moratorium would allow time for an objective reassessment (by all relevant stakeholders) of what is actually necessary to safely modernize the electrical grid system. Great article. In what city are the Smart Meters with the flashing RED warning light installed? Which utility? This would be very good to know. The report on these meters is that they were being installed in western Michigan by Consumers Energy.